For those with a dry skin type looking for the ultimate in anti-ageing skincare combining effectiveness and a pleasure for the senses. The Ultimate Time Solution Rich Cream reveals new cellular regeneration power for ultimate comprehensive anti-ageing action. The Divinely nourishing texture concentrate a precious raspberry seed oil, helping dry and very dry skin regain suppleness and comfort. An sensual exprience which reveals the beauty and youthfulness of every woman. the skin regains its comfort and suppleness. Take a small dab of Cream and warm it in the palm of your hands. Apply the Cream: stretch the cream from the centre of the face outwards, from the eyebrows towards the hairline and from the facial contour towards the base of the neck. Finish the application by pressing with hands for two seconds before releasing. Three times. Application technique based on THALGO's professional expertise. 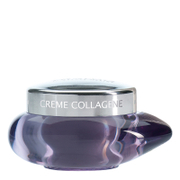 1: Apply the Cream: stretch the cream from the centre of the face outwards, from the eyebrows towards the hairline and from the facial contour towards the base of the neck. Finish the application by pressing with hands for two seconds before releasing. Three times. 2: Sculpt the facial contour and neck: simultaneously glide the back of your fingers on both sides of the facial contour, from the chin towards the ears. Press with your fingers for two seconds, then release. Work back down the neck with small alternating stretching movements. Three times. Aqua (Water), Cetearyl Alcohol, Butylene Glycol, Cocoglycerides, Cyclopentasiloxane, Dipropylene Glycol, Simmondsia Chinensis (Jojoba) Seed Oil, Triticum Vulgare (Wheat) Germ Oil, Cyclohexasiloxane, Cetearyl Glucoside, Sodium Palmitoyl Proline, Phenoxyethanol, Hydroxyethyl Acrylate/Sodium Acryloyldimethyl Taurate Copolymer, Parfum (Fragrance), Squalane, Nymphaea Alba Flower Extract, Chlorphenesin, Glycerin, Algae Extract, Allantoin, Polysorbate 60, Ethylhexylglycerin, Sodium Hydroxide, Maris Sal (Sea Salt), Aloe Barbadensis Leaf Juice, CI 42090 (Blue 1), CI 17200 (Red 33), Benzoic Acid, Dehydroacetic Acid, Hydroxypropyl Cyclodextrin, Ethylhexylglycerin, Acacia Senegal Gum, Propylene Glycol Alginate, Acetyl Tetrapeptide-5, Palmitoyl Tripeptide-38, CI 19140 (Yellow 5), CI 17200 (Red 33), Sodium Phytate, Glyceryl Acrylate/Acrylic Acid Copolymer, Benzoic Acid, Dehydroacetic Acid, Palmitoyl Tripeptide-38, Hydroxypropyl Cyclodextrin, CI 19140 (Yellow 5), Alcohol, CI 17200 (Red 33), Linalool, Butylphenyl Methylpropional, Citronellol, Alpha-Isomethyl Ionone.